The days of the old Jarl are coming to an end, and as he passes on heirless, many rise up to the challenge of proving themselves worthy of succeeding him. As a young Viking leader you will build houses and ships, recruit followers, and gain powerful allies to raid faraway lands in search of wealth and glory. Foresight, boldness, and skillful planning will be required, if you want to become the new Jarl and rule in the name of Odin! 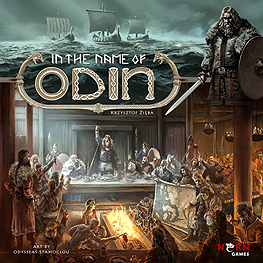 In the Name of Odin is a game of strategy and skill for 2-5 players. On their turn, each player will use a hand of cards to perform multiple actions constructing different structures in their village, building ships, gathering three types of Vikings, recruiting a powerful ally, and going on raids that score them points needed to win the game. Each building, ship, and ally will come with their own special ability, allowing players to build clever and unique combinations every game. Build houses and ships. Gather men and recruit allies. Lead wisely and raid boldly. Become Jarl to rule all in the name of Odin!